How It's Made: Silver Spoon. Today, spoons are usually mass produced in factories out of stainless steel using heavy duty stamping and forming machines, but they used to be hand forged and sometimes still are. Spoons started out being hand carved out of wood, stone, ivory and bone. From there the use of metals in the 15th century facilitated the making of more sturdy utensils, metals such as bronze, brass, pewter and eventually silver were used. These metal spoons were initially made by hand forging the forms, later as technology progressed, more industrial methods were implemented like stamping machines and hydraulic forming dies. Prior to 1700 people would carry their own spoon or utensils with them to eat rather than a house having multiple place settings. A particularly useful side effect of using silver for spoons and various other tableware is that it is antibacterial. Silver ions inhibit the metabolism of bacteria preventing them from growing. Several metals are inherently antibacterial, the effect is called the oligodynamic effect. The following images show the process that I used to create a forged silver spoon. It is important to make sure not to hammer too much on the outside edges of the metal for the bowl, doing so would make the edge of the spoon too thin and potentially sharp when done. Also, throughout this process the metal is annealed by heating with a torch several times. This ensures that it is malleable when hammering, if the metal is hammered without periodic annealing it will become very hard and may crack. The technique of forging is also used in blacksmithing where the metal is hammered while hot. 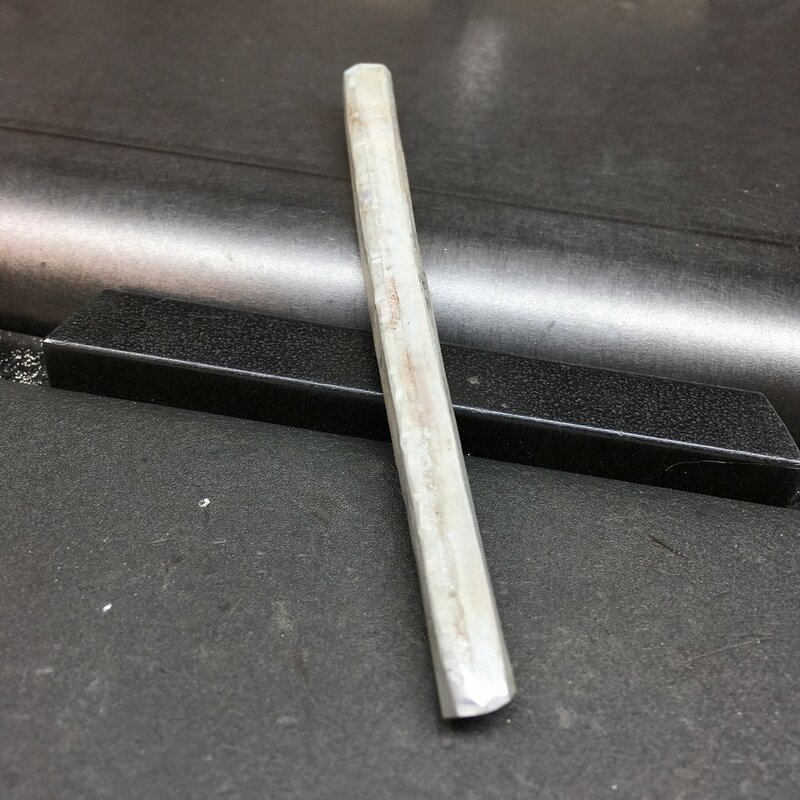 In the case of non-ferrous "soft" metals like gold and silver it isn't necessary for the metal to be hot while hammering as the metal moves easily in a cold but annealed state. Hammering or bending a red hot piece of gold or silver will usually cause the piece to crumble or break. I started with a billet of sterling silver. Using an anvil and forging hammer, I forged the beginning of the bowl of the spoon. I continued forging to spread the silver outward to widen the metal enough to form a bowl shape while starting to hammer out the form for the handle. Then, forming the bowl shape by deepening it using dapping tools and also forging the neck of the handle to make it narrower and longer. Dapping tools are steel ball shaped tools that are hammered against metal to form dome shapes. After refining the hammer blows against the silver by planishing/tapping the hammer dimples down smoother, the spoon is refined further by filing. Once filed smoothly into the form needed it is hallmarked or stamped with a fineness stamp. In this case it is stamped with a "925" stamp to indicate that the metal is sterling and is 92.5% pure silver. It is then sanded with sandpapers with grits of 220-1000 grit. Following that, it is polished using a motorized polishing machine with felt buffs and polishing compounds to make it really shine. Forging is a very old technique and is unbelievably fun to do. Watching such a hard unmoving material change into a useful and/or beautiful object is almost magical. I thoroughly enjoyed making this spoon and look forward to forging again soon.